When you live in a place with more palms than snow, stereotypical images of Christmas just don't work. It's awfully hard to go on a sleigh ride at the beach, after all. But Californians, being an imaginative lot, have come up with a whole batch of variations on Christmas traditions and some new ones of their own, too. 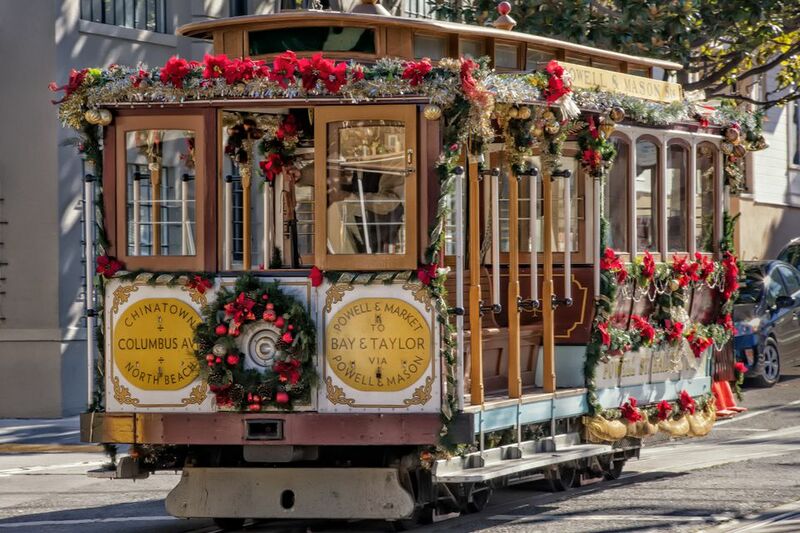 You can watch a Christmas parade made entirely of boats or one full of tractors, see Santa Come ashore on a surfboard, walk or drive through over-the-top holiday lights, or visit some historic properties decked out for the season. Envision an old-fashioned Christmas parade that's taking place at the nearest marina or harbor, substitute out the floats for decorated and lighted boats, and you've got a harbor boat parade. You can watch one of the biggest ones at the San Diego Harbor's Parade of Lights, or take in the super-popular Newport Beach Christmas Boat Parade. In Northern California, with more than 100 lighted pleasure crafts, try the Oakland/Alameda Estuary Lighted Yacht Parade. In Santa Cruz, Roaring Camp Railroad runs a Holiday Lights Train. It leaves from the boardwalk on a short trip through town and back and is an especially festive, old-fashioned affair with live music and a visit from Mr. and Mrs. Claus. You can also take a Polar Express trip in Sacramento, but you'll have to plan ahead—this event sells out in early October. Santa also takes a ride with his friends at Railtown 1897 State Park, November through December. The a capella singing group Chanticleer is a San Francisco area favorite, performing Gregorian chants and popular tunes in some of the area's prettiest venues, including historic Spanish missions. They also perform once every holiday season in at the Disney Concert Hall in LA. Check their website for more information. Southern Californians get especially exuberant when it comes to outdoor light displays. Try the LA Zoo Lights which are described on the last page of the Griffith Park guide, go north of San Diego to Encinitas to the San Diego Botanic Garden, or take the Santa Barbara Trolley's lights tour, but plan ahead—this event sells out in early October. In Silicon Valley, Vasona Park near Los Gatos hosts the drive-thru Fantasy of Lights in Vasona Park. Also well worth your time if you're in the area are the family-friendly rides and lighted displays at Gilroy Gardens. The Huntington Harbor Cruise of Lights adds a nautical twist to seeing the Christmas lights. You can take a charming trip through the harbor's waterways past houses decorated with enough lights to make Las Vegas jealous. The Mission Inn Festival of Lights has been a local favorite for over two decades. If you're looking for some lights to see somewhere else, try the California Christmas Lights website, which covers hundreds of houses and neighborhoods in northern and central California. The best way to find out all the things that are going on in each major tourist area is to consult our guides. Check out the festive decorations and special events at Disneyland at Christmas, head south for Christmas in Los Angeles or San Diego, and check out all the traditional (and unique) seasonal events for Christmas in San Francisco. Bracebridge Dinners: Yosemite's historic hotel dining room transforms into a 17th-century English manor for a three-hour pageant of classic carols, Renaissance rituals, music, and food. You'll share the celebration with Squire Bracebridge and his family, their servants, the Lord of Misrule, minstrels, and other characters. It's one of the most fun ways to celebrate the holidays that you'll find anywhere in the state, and the meal is a show in itself. Surfin' Santa: In most places, Santa arrives in a sleigh. In Capitola, just south of Santa Cruz and down at Seaport Village in San Diego, he arrives on a surfboard instead. Decked out in a red wetsuit with all the white trimmings, the Surfin' Santa usually comes ashore on Thanksgiving weekend. Tractor Christmas Parade: Calistoga, the northernmost community in Napa Valley, hosts an annual Christmas parade with a twist. Their Tractor Christmas Parade is held the first Saturday in December. Hearst Castle: The castle is decorated for the holidays and offers a Holiday Twilight Tour from mid-December thru early January. Oakland's historic Mountain View Cemetery: The cemetery hosts a Circle of Lights every December, with holiday lights and activities. Historic adobe homes: Located within Monterey Historical Park, these open in early December for candlelit tours called Christmas in the Adobes. Hiking California's Lost Coast Trail? Here what you should know!